We travel with our firearms all the time, taking them to the range, on hunting trips or carrying them on our person, as permitted by law. As a result, there will be times when you might have to leave your firearm in your vehicle. This creates a situation that deserves careful consideration—the last thing you want is to have your gun stolen and potentially misused by a criminal. In some states, you could even be subject under the law to serious penalties and fines for failure to properly secure a firearm. Unfortunately, thefts of firearms from vehicles are on the rise. Thieves commonly steal cars and trucks even when they don’t obviously contain firearms—a reminder that vehicle door locks are not totally secure. The glove compartment or console of your car or truck, even if lockable, should not be considered a secure storage device either, as it can be pried open too easily. If you need to leave your firearm in a vehicle, here are some important safety considerations to keep in mind to help prevent theft and unauthorized access. Take note of and safely control the muzzle direction of firearms in vehicles. This is one of the main rules of gun safety and applies to the inside of vehicles as well as any other location. • When finished using your firearm outside your vehicle, unload it before you re-enter your vehicle. • Even after a long hunt or a day in the sun at the range, always check, and then double check, that guns are unloaded before placing them in a car or truck. • Be very careful if you must unload a firearm in the confined space of a vehicle so as not to have an accidental discharge. If your location allows, it is safer and easier to unload the firearm outside the vehicle. 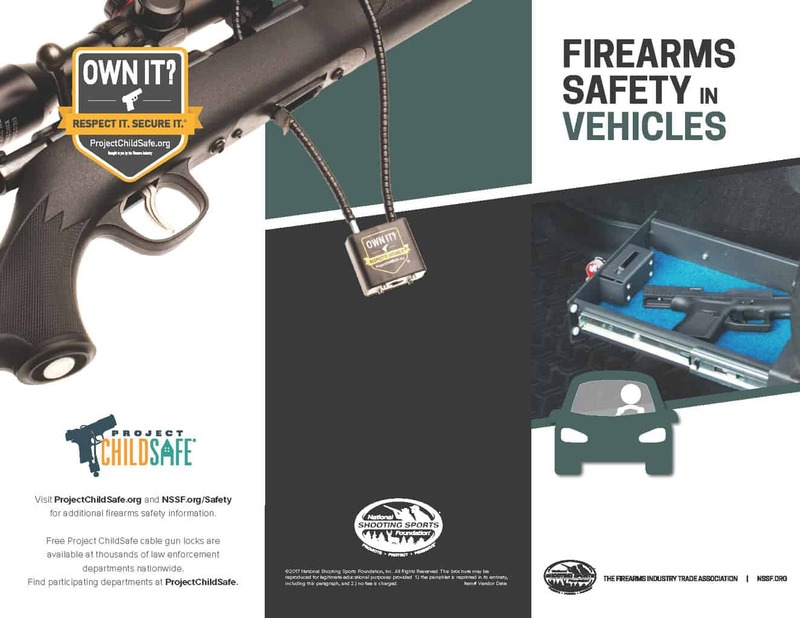 • Never leave firearms in an area of the vehicle where they are accessible to children or pets. • Use secure temporary storage for firearms in vehicles. • A lockable gun case or a lock box may be the most practical choice to securely store a gun in a vehicle. These come in a range of prices and models. • If you’re concerned about quick access to your firearm, many types of lockable safes allow for extremely fast access of your gun while at the same time helping to prevent unauthorized access. • Secure the lock box to the vehicle, if possible. Some companies make custom concealed compartments for specific model vehicles. • Keep firearms and ammunition out of sight to avoid tempting thieves. for additional firearms safety information.